She writes a versed review. Vampyric paranormal romance is delivered in verse in Elfineness by T.K. Varenko. This epic poem of over 300 pages recounts the life of Luella, an elfin maiden transformed into a vampyress during her struggle to find her one true love. Gods and monsters from various regions of fantasy and mythology are intermingled in a whole new world as the story of Luella’s existence unfolds through different chapters, each one set out as part of the same poem. The story moves between the present and past to recount the complex life and loves of its protagonist, whilst also explaining the devastating changes to humanity that have caused the post-apocalyptic land we meet at the opening of the piece. If you have never read the works of Milton or Dante, then poetry on this scale may be something of a shock to your system. 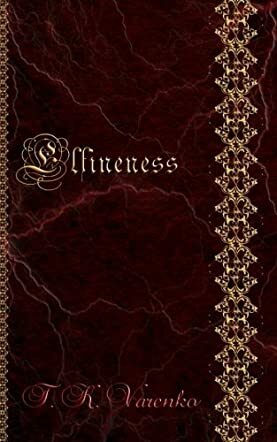 Elfineness is an ambitious work that succeeds in creating a luscious atmosphere and a darkly wonderful plot with deception, romance, pain and heartache. T.K. Varenko presents a uniquely imaginative vision with many beautiful phrases. I particularly enjoyed some of the chapter endings where the ‘lesson’ of that particular moment was summarised in a sinister and satisfying way that reminded me of a Shakespearean sonnet. For me there were two things that occasionally interrupted my reading. One was the fact that sometimes the clarity of the plot was sacrificed in order to force the rhyme in the verse, something which meant I had to re-read sections. The other was the modern terminology and casual dialogue that occasionally crept in, which I felt spoiled the beautiful verses of the narrative. For those who can overlook these elements, Elfineness will definitely be an excellent read.